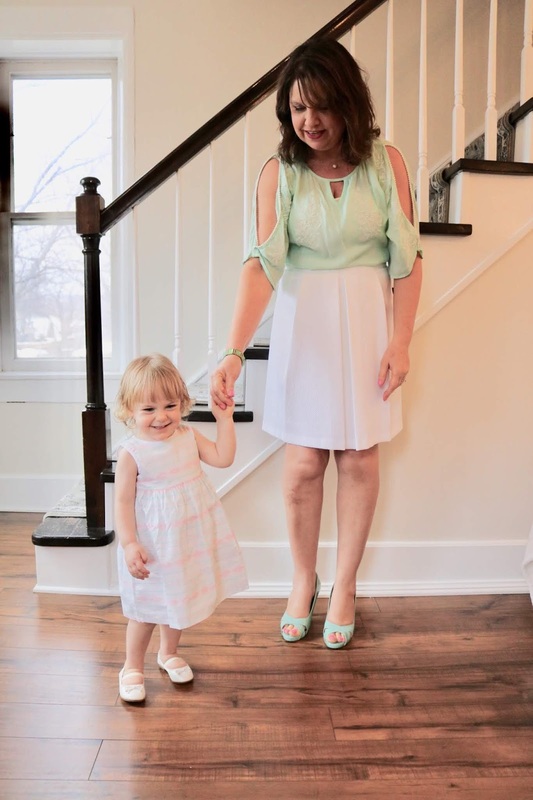 My granddaughter Alethea and I are excited to show you our Easter outfits today. Alethea came to visit me for four days last week and we had so much fun together. We had a tea party, watched movies and ate popcorn, and played in a fort that Grandpa built out of a big box. Since I just got my new runner installed the day before Alethea arrived, I thought what better place to take pictures than the staircase. Alethea doesn't have stairs in her apartment, so she was tickled pink to climb up and down the stairs. 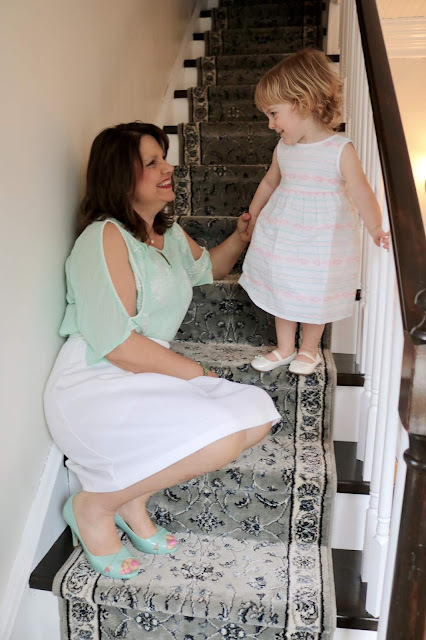 I love pastel colors for Easter, so I wore a mint embroidered top with cut outs in the sleeves with a white skirt and mint heels (all old). Alethea wore a pretty white dress with pastel stripes and white shoes. Alethea is 21 months old now. She is starting to string words together to make sentences. She remembers me even though she may go a month or two without seeing me. Alethea and her parents met us at a restaurant when they first arrived, and when I saw her walk in I ran to her squealing with delight all the way. I reached out my arms to her and she just so sweetly smiled at me. I said "You remember me!" and her dad said "Of course she did, she talks about you all the time.". I'm always so amazed at how beautiful our pictures turn out, because our photo shoots are always a challenge. Even though it was a great idea to photograph on the stairs, she didn't want to sit still for a minute; she just wanted to climb the stairs. I just love these feet pictures! So cute! Because Easter and Mother's Day are only two weeks apart, I won't be spending Easter Sunday with Alethea this year. We will meet up in the Milwaukee area for Mother's Day. 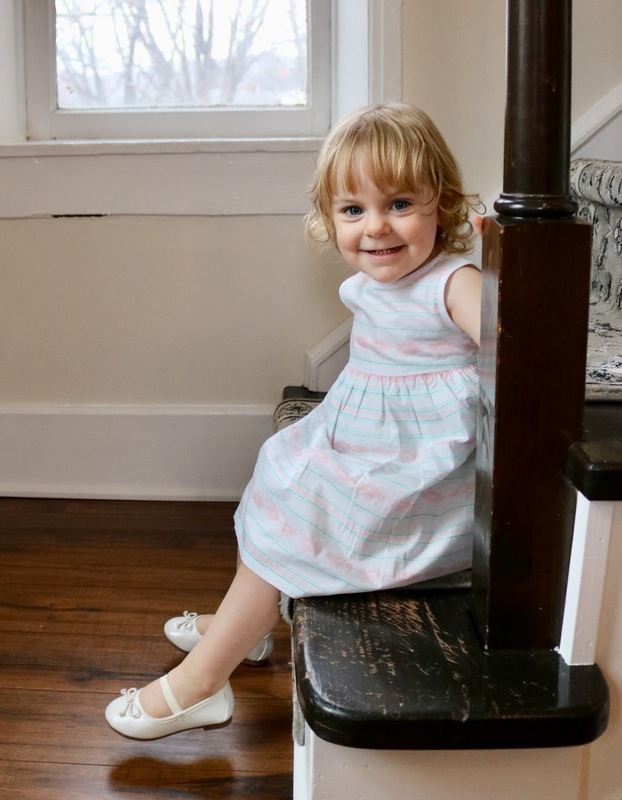 It was nice to see her in her Easter dress while she was here. She is such a little pumpkin. She makes me laugh and smile all day! Her expressions are priceless! 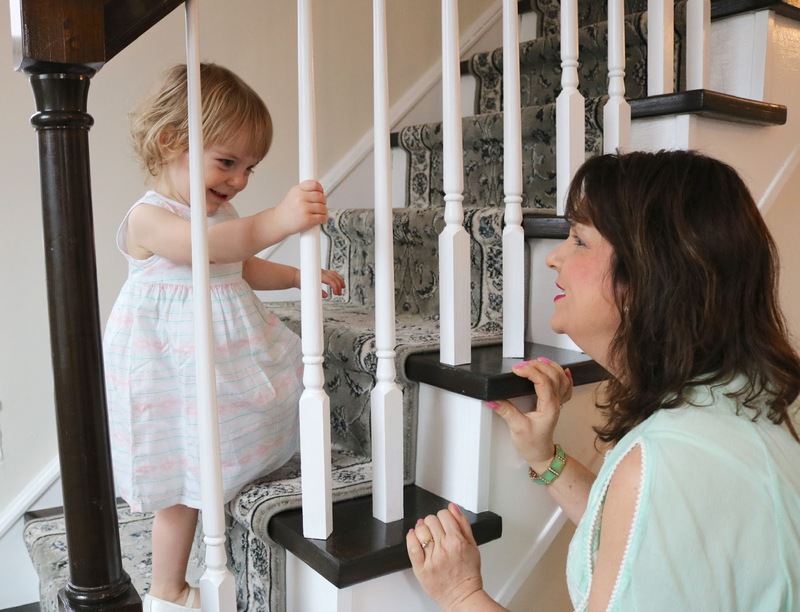 We made a game of peek-a-boo through the stair spindles. One part of being a long-distance grandparent is seeing how much they have changed since the last time you saw them. Kids grow so fast, and so many changes can happen in a month or two. In February when I saw her last, she was only saying one word at a time. A month later, and she is making sentences. Amazing. I am so grateful I can still pick her up and hold her in my arms, if only for a little while. Such a cutie pie she is. If you're wondering what the mark is on my leg, it's what is left over from the severe burn I got at Thanksgiving. I'm hoping it's not permanent. I just started putting Mederma on it, but I realize bad scars can take years to fade, if ever. Of course, whatever is going on outside is always more interesting than smiling for the camera. 🤣 But, as always, it makes the cutest picture! She actually did such a great job climbing the stairs and was so proud of herself. 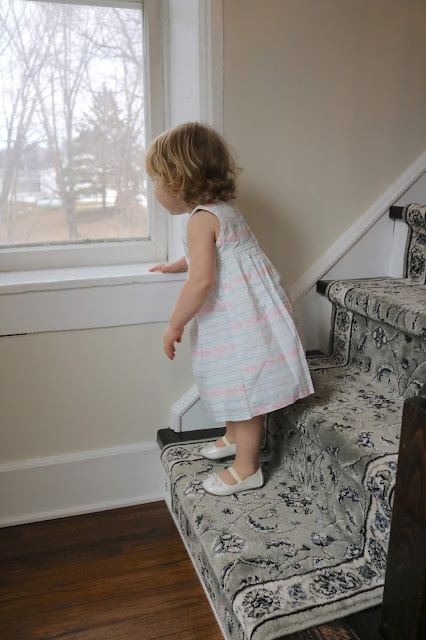 Of course, we never let her climb the stairs alone, and we barricaded the staircase off so she couldn't climb them when no one was watching. Children teach us how to find joy in the smallest of things, like climbing a staircase. Alethea also taught me how to be proud of myself for even the smallest accomplishments. 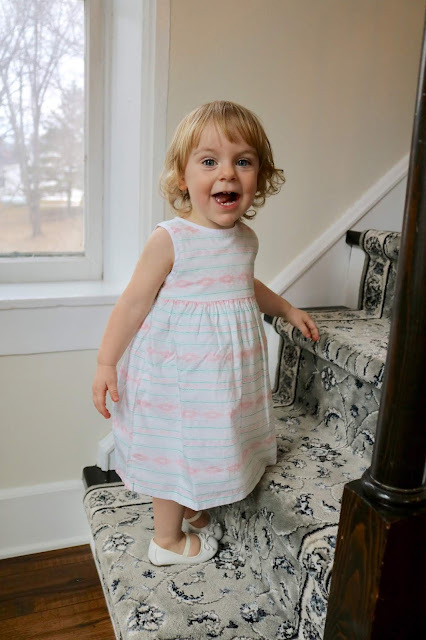 She was so proud she could climb the stairs like a big girl. She giggled with delight every time she reached the top. What a heart warming post, Amy. Kids are such joys and energy!! And opening our eyes to a whole different perspective. Going up the stairs. We may see it as a chore, but her fascination with it is so fun!! Thanks Jodie! Energy is right! But, they also take long naps, so they must know something we don't, right? She is such a sweetie, Amy. I so miss when my kids were that age, time flies so fast and we don't even realize it until we're older! You both have beautiful outfits. Love her cute dress and the mint color of your shirt is gorgeous! Ellie, I can't even remember when my kids were this age. They do grow up too fast. It seems just yesterday Alethea was born, now I have another one on the way. She really had grown. 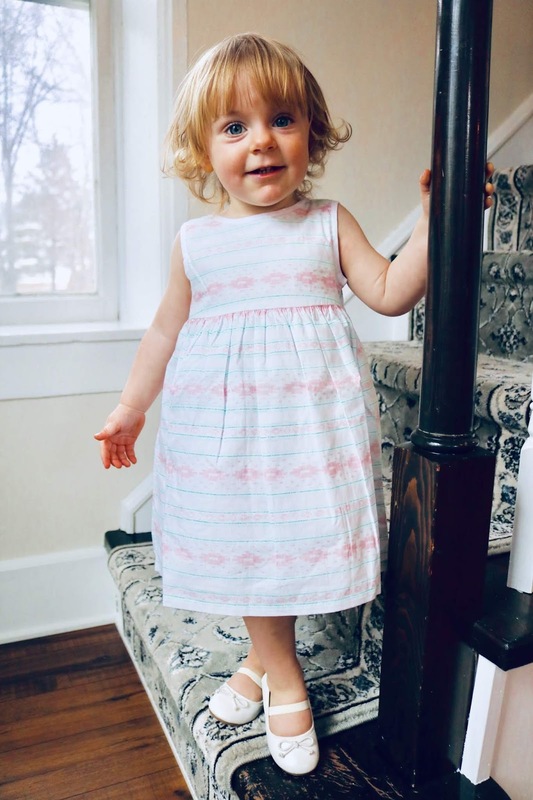 My youngest is 17 months old and it is such cute age. 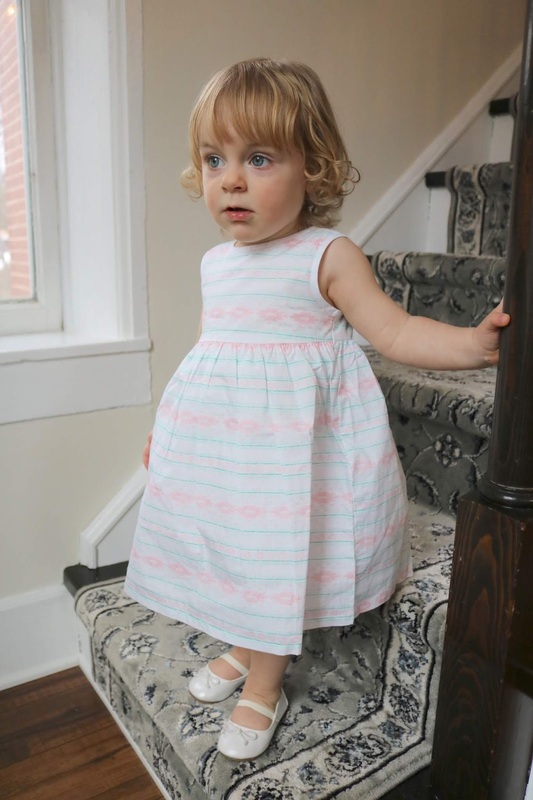 Alethea is adorable in her dress! Thank you! She sure has grown up fast! Too fast! Awww how cute! Kids grow so fast so it's fun you are able to have these times with her! Thanks Ruth, I try to make the most of every minute I get to spend with her. Thank you, and I'm so happy to hear you love to see them. They are very time consuming and challenging to do, but we will keep them up as long as we can. Oh, my dear, sweet friend...how I love this post. It brings tears to my eyes. Lucia and I have so enjoyed playing on the stairs during her recent visits. She doesn't have stairs at home and has learned to manage them masterfully at mine. You gals are the cutest. The photo of the shoes and tootsies is one of my favs. Peeking through the spindles, Alethea sitting on the first steps. These should be framed and put up every Easter to remind you of these special moments. Had not noticed your owie from the burn in the fall but do remember you writing about it. Your legs are lovely and while you may feel self-conscious, I assure you no one else thinks a thing about your scar. Love the mint color of your top and shoes. Give me green in every shade. Oh Leslie, you are so sweet. 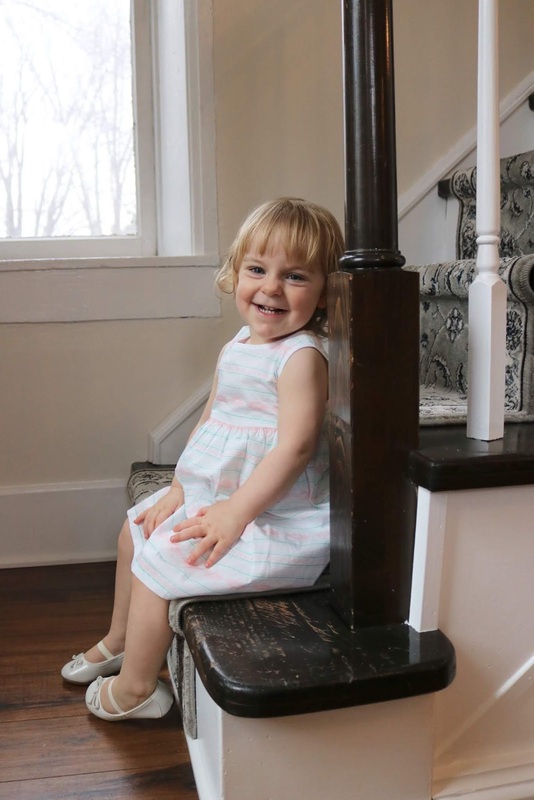 I'm glad you and Lucia had some time to play on the stairs too. I have so many pictures around my house it's ridiculous! They are all so lovely, I have a hard time narrowing down which ones to print. As for the burn, thanks. 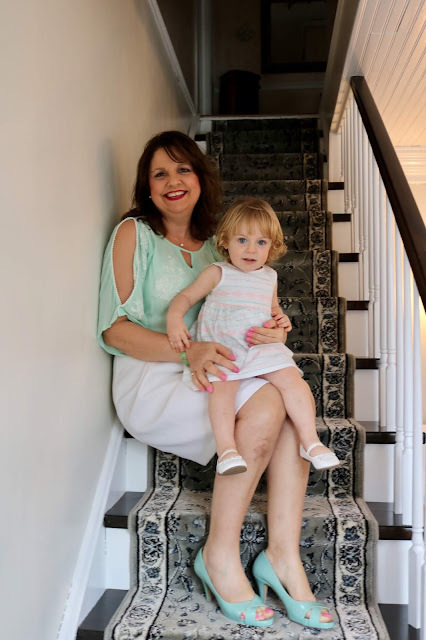 My legs were one of the few nice physical attributes I had left in my old age and when I got the burn, it was very discouraging. I plan on wearing a lot of Maxi's this summer, but now my legs will have to be seen eventually. Such a sweet photoshoot! I love the pictures of both of you and your grandaughter and the pictures of the shoes! Tje mint color is beautiful on you, a great Spring color. She's an absolute doll and I can tell the two of you have a special relationship! I loved seeing the two of you together Amy and she's certainly growing and is definitely past the baby stage and into being a little girl. 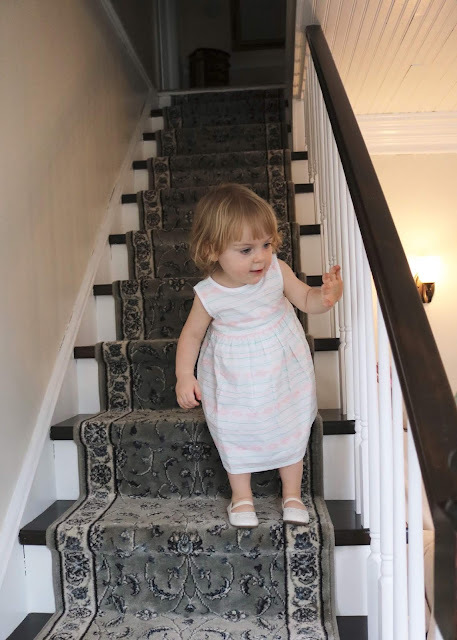 We have stairs in our house and our granddaughter could go up and down them all day if she had the chance - it's exhausting because we have to go up and down with her each time. I also wondered about the mark on your leg (thought it might be a bruise - I get some doozies of bruises on my legs) but it sounds a bit more permanent after the turkey burn - hope it clears up soon. Thank you Leanne! Yes, I've been reading that a lot about children and stairs. I don't remember them desiring to climb when they were little, but it seems to be common. I hope the burn mark goes away too! Such a shame it happened. Thanks Deb! It is hard, but we try to make the best memories whenever we're together. 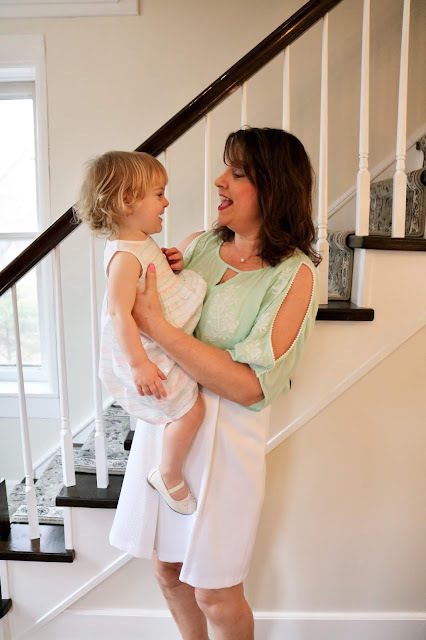 Beautiful memories for your Amy and your granddaughter is such a cutie! Times spent with our grandchildren are so precious and I don't think anyone who isn't a grandparent can really appreciate the depth of love. Thank you for sharing at #MLSTL and have a beautiful weekend. Thank you Sue! 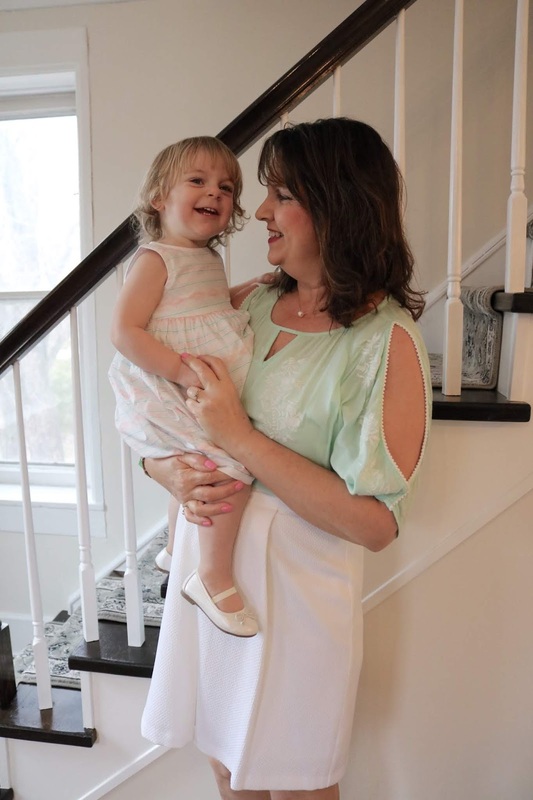 No, I had no idea how much I would love my granddaughter till I had a grand baby. Thanks so much! I so appreciate it and I will be sure to put it on my “Where I’ve Been Featured “ page. Sooo adorable! She's so precious. Love your photos dear!